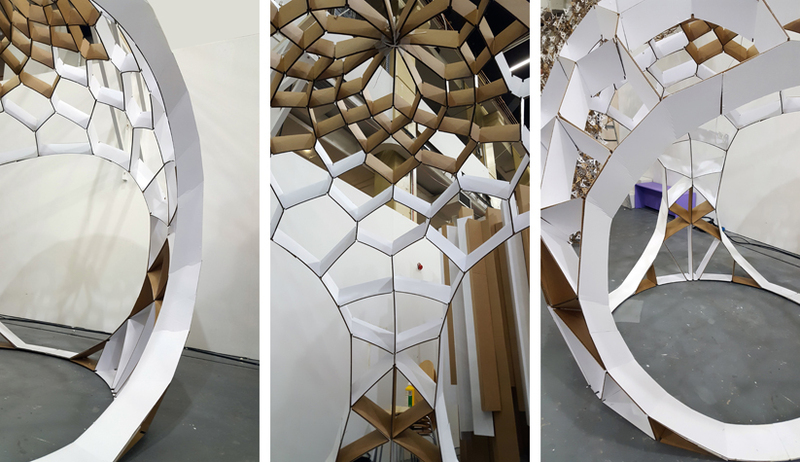 A thin shell cardboard structure inspired by tesselation patterns found in nature. Inspired by the classical concept of veriditas – a tendency to pattern in nature where life strives against entropy – the pavilion was designed using digital form finding techniques to produce a pattern of continuous tesselation allowing for an even distribution of forces through the shell form. 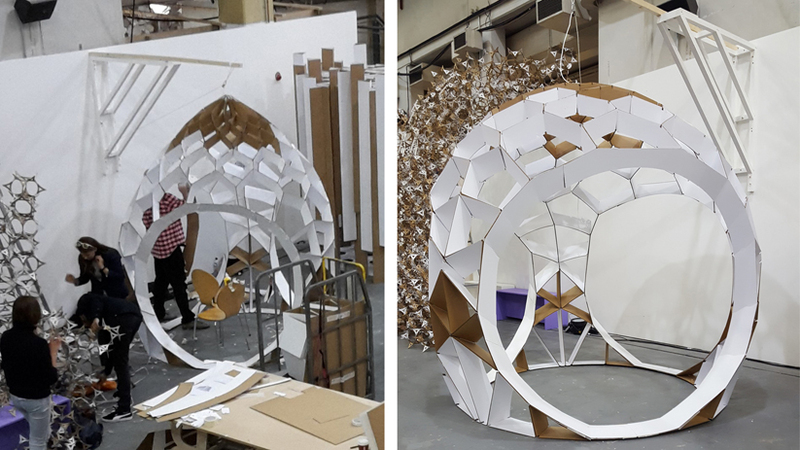 The pavilion was designed and built as part of Westminster University FabFest2016, with a student team from Westminster with the aim of creating an experience of biophillic form finding. 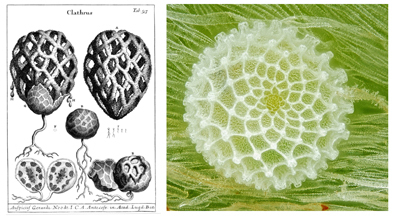 On the right, two examples of structural tesselations in nature. Clathrus Ruber fungus and butterfly eggs were the inspiration for an egg shaped shell structure which could evenly distribute the self-weight of the pavilion. Kim Stanley Robinson describes veriditas as ‘a kind of pattern gravity, a holy greening power’. Using digital form finding techniques, simulating physical forces of pressure which create an analog to the self-weight of the structure under gravity, the pavilion structure becomes a representation of a digital/ design synthesis technique which produces a reformation of the life pattern tendencies. As a pavilion the structural tesselations allow for a joyful experience of the purpose and beauty of intelligence found in nature. The pavilion was constructed from the top down out of cardboard strips connected and allowed to settle into its predefined shape under its own weight.